For all those a bit out of the store opening loop, New Bond Street saw the opening of the latest in the Louis Vuitton chain of stores, boutiques and elegant maisons. Last Tuesday the world of fashion and celebrity glitterati gathered for the launch event. The crowd included Louis Vuitton designer Marc Jacobs, Gwyneth Paltrow, Elle Mcpherson, Carine Roitfeld, Thandie Newton, Gemma Arterton and Natalia Vodianova. But this is no ordinary designer boutique. This is not even known as a store. They’re calling it the Louis Vuitton New Bond Street Maison and its architect, PETER MARINO, describes it as “the most luxurious Louis Vuitton Maison in the world” – quite a steep claim! The maison is certainly not just about shopping, in fact it’s really more of an experience. Stacked high to the ceiling are fabulous art installations that aren’t your usual stuffy sculptures. Thanks to Marc Jacobs’ direction at Louis Vuitton, the numerous artist collaborations are reflected in the maison. 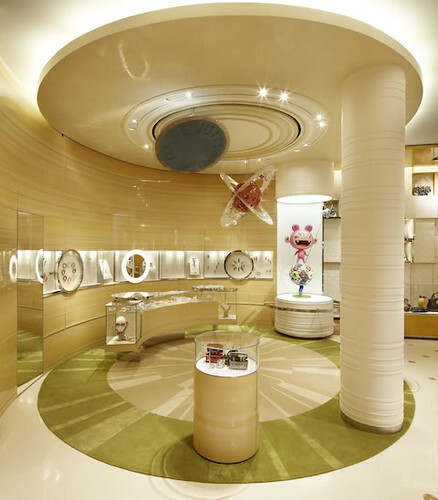 The 15,000 sq meter, three-floor space features the usual metal grill casing that all the Louis Vuitton stores have. Art encased in glass containers in the front windows creates a grand spectacle even before entering the store, and then you are faced with an almighty, shiny grilled wall stocked to the very top with luggage. Panels on the wall slip and slide around like puzzle pieces, containting silk scarves and hand bags and you feel like it’s all a bit too clever for a shop. This is more like a theme park attraction for glamorous adults. 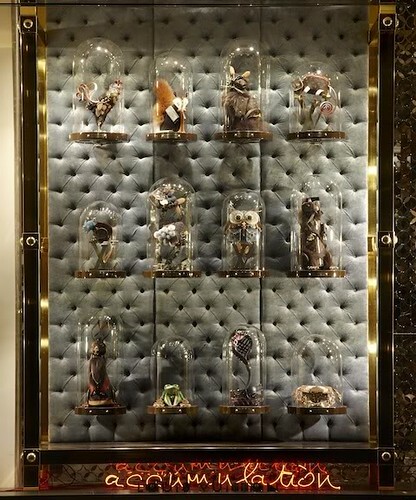 One of the most impressive art installations in the maison is the exhibition by Katie Grand. She has designed a selection of mannequins, which stand in a temporary exhibition space, wearing pieces from past season Louis Vuitton ready to wear collections. The seasons have all been muddled together and this has curiously created a collection of its own entirely. It’s an interesting take on a celebration of Louis Vuitton ready to wear, much more creative than just having a carbon mannequin copy of catwalk looks. As you walk around the store – or maison, although there are some fantastic and creative designs and architecture, you never get the impression that that’s all Louis Vuitton are trying to do, just give you an experience. Clothes and accessories have been specifically placed around the shop and there is definitely a focus on the products. Whether we’ll all enjoy this type of shopping environment is another matter. But one thing is for sure, Louis Vuitton have worked hard to make their customers smile and they have geared everything in the store towards celebrating the brand. This entry was posted on Sunday, June 6th, 2010 at 10:22 am and is filed under Fashion.